Body-based practices such as yoga, qigong and Pilates are used by New Zealanders to improve their health and wellbeing. 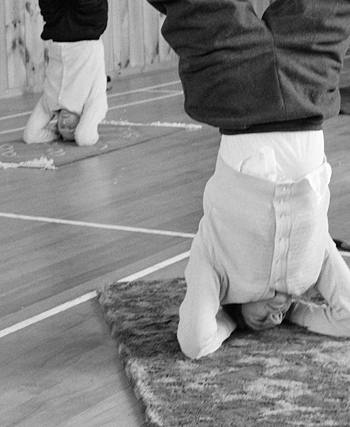 In the 2000s elite athletes were practising yoga – as were some prisoners. Exercise systems have been developed within many cultures to improve health, fitness and wellbeing. Many forms have ancient origins. Yoga originated in India in ancient times, and promotes the union of mind and body. The earliest regular classes in New Zealand may have been in Tauranga in 1962. A national association for yoga teachers was set up in 1970. In 2012 yoga was taught around the country. It was practised by some elite sportspeople, and there were programmes to teach yoga in prisons. Qigong (pronounced chee-gong) was developed in the 1940s, based on ancient Chinese practices of breathing, meditation, martial arts and gymnastics. Various forms are taught in New Zealand. T’ai chi derives from qigong. Some forms are practised for exercise and relaxation, but others are active martial arts. Dave Thew of Christchurch has won gold medals at international t’ai chi championships. Chinese immigrant Loo-Chi Hu has taught t’ai chi since 1967. Australian actor Frederick Alexander developed the Alexander Technique in the late 19th century. The technique teaches people how to stand, hold themselves and move in order to eliminate physical tension. In 2012 there were about 28 registered teachers in New Zealand. Pilates, developed by German fitness instructor Joseph Pilates, aims to develop controlled movement from a strong core (the muscles at the body’s centre). It has been taught in New Zealand since the mid-1990s. The Feldenkrais Method was developed by Israeli athlete Moshe Feldenkrais to rehabilitate patients after injury. The first Feldenkrais trainers worked in New Zealand in the 1980s, and in 2012 there were 57 certificated teachers in New Zealand.